With the Cricket World Cup underway and the Rugby World Cup set to begin later in the year, let us look back at the man who created history in 2003 by becoming the first – and till date only – athlete to represent his country at both cricket and rugby World Cups. Born in Windhoek in 1972, Dr. Rudolph ‘Rudi’ van Vuuren had the unique distinction of playing for Namibia in two World Cup tournaments in the same year. 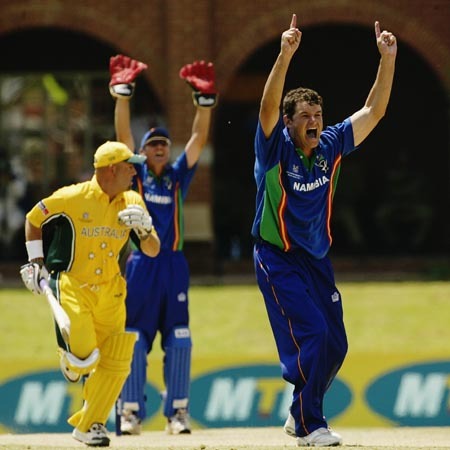 A physician by profession, right-armed van Vuuren opened the bowling with his medium pace, characterised by a round arm action, in five of Namibia’s six matches in the 2003 World Cup held in Africa. Eight months later, he participated in the rugby union World Cup in Australia, where he played as a fly-half in Namibia’s last group match. Namibia qualified for the cricket World Cup for the first time after finishing runners-up in the 2001 ICC Trophy. In their first World Cup match, they were beaten by Zimbabwe by 86 runs in a rain-hit affair at Harare. This was the only match that van Vuuren did not play. He duly made his ODI debut in the next game, against Pakistan at Kimberley. He ended with figures of 0/47 and later scored 14 from number eleven as Namibia were heavily defeated by 171 runs. Two days later, van Vuuren achieved the best ODI bowling figures by a Namibian. Up against England at Port Elizabeth, he gave his side the perfect start by removing Nick Knight and Michael Vaughan to reduce the opposition to 43/2 inside ten overs. Half-centuries from Marcus Trescothick and Alec Stewart put England back on track. The final over began with the score reading 262/7. Van Vuuren was entrusted to bowl it and though he conceded ten runs, he struck thrice to help his team bowl out England for 272. He dismissed Craig White, Ronnie Irani and Andy Caddick off the second, fourth and sixth ball respectively to finish with a return of 10-2-43-5 – one of the best ever World Cup performances by an Associate player. Namibia replied spiritedly and ended with 217/9. The honour of the Man of the Match however went to Jan-Berrie Burger, who gave England a scare with an attacking 85 from 86 balls while opening the innings. Namibia’s next opponents were India at Pietermartizburg. After being put into bat, the Indians posted a huge total of 311/2 in their 50 overs. Van Vuuren was easily the best and the most economical of the bowlers, finishing with 2/53 in ten overs. His scalps were the prized ones of Virender Sehwag and Sachin Tendulkar. The latter smashed 152 and shared a 244-run stand with Sourav Ganguly (112*) for the second wicket. Namibia were bundled out for just 130 in reply. The match against Australia at Potchefstroom was a highly forgettable one for Namibia as well as van Vuuren. Australia piled up 301/8 after batting first, with Matthew Hayden scoring 88. Andrew Symonds and Darren Lehmann too scored fifties, with Lehmann amassing a then record 28 runs off van Vuuren in the last over of the innings. The burly all-rounder went 4,4,4,6,4,6 as van Vuuren ended with nightmarish figures of 10-0-92-0. Glenn McGrath (7/15) then destroyed the Namibians, who were shot out for 45 in just 14 overs to lose by a then record margin. Namibia gave a much improved display in their final match against Netherlands, losing by 64 runs after the Dutch had piled up 314/4. Van Vuuren, in what was to be his final ODI, finished with 1/63, snaring opener Edgar Schiferli. Namibia thus lost all their six matches and since then have never played in an official ODI match. Later in the year, the World Cup campaign of the Welwitschias, as the Namibian rugby team is known, was as poor as the cricket team’s performance. Clubbed in a tough group with hosts Australia, Ireland, Argentina and Romania, they lost all four matches, scoring 28 points and conceding a whopping 310. Their lowest point was a record 142-0 thrashing by Australia at Adelaide. Van Vuuren, who was also part of the 1999 World Cup squad, missed out on the first three games – against Argentina, Australia and Ireland – due to a leg injury. However, he ensured that he did not miss out on his place in history as he came on as a replacement in the 70th minute of Namibia’s last game against Romania at Launceston, which they lost 37-7. ”It’s been a fantastic year. There is nothing in life so rewarding as to walk onto the field and know you are playing against the best in the world. Cricket’s always been my second love, rugby is what I really prefer. I’m more of a natural rugby player than a cricket player.”, he said in an interview after the tournament ended. Van Vuuren, specialising in Aids cases, has been at the forefront of the battle against the dreaded disease in his country. He is also an obstetrician. Interestingly, between the two World Cups, van Vuuren helped deliver 70 babies in his clinic in Windhoek. As of today, besides his practice, he also runs a medical centre as well as a wildlife sanctuary along with his wife Marlice, who is a well-known conservationist. They are devoted to the causes of providing free treatment to locals and protecting and preserving various animal species. Shame that someone playing in two WCS is highly unlikely to happen again (at least for men – Ellyse Perry has played in WCs at cricket and football but not in the same year).